So, picking up from the previous issue, Iris has agreed to work for Magni Global, and we see her out on her first assignment. Now, right off the bat, I have to say I was a bit confused, as we saw in issue one that Magni Global went after Iris because a potential client, a billionaire oil man, wanted her as his bodyguard and would therefor would only hire engage their services if they could provide her. Yet we don’t see her guarding that man, nor is there any mention of him, in this issue. Instead, Iris is sent to provide security for a political figure who is giving a speech at a college campus. Mackenzie is alongside her, and is doing research into Iris’s background and thus we get a flashback sequence in which we learn about one of Iris’ previous assignments, in which she was sent to go undercover to infiltrate a Japanese Mafia group. 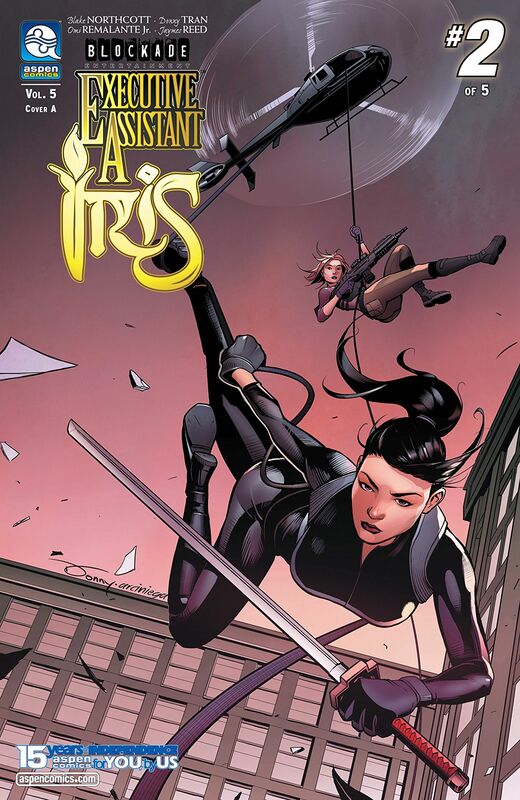 This is a good way to show off some more of Iris’ skills, as we she indeed worked as assassin (a fact that was hinted at, but not expressly said in the first issue) and is adept at killing people, when necessary. It also shows her ability to read people, and gain their trust. As with the assignment on hand, as Iris learns more of the event, she becomes wary of the plans, and feels that Magni Global has not properly prepared for every possibility, including not giving her all the tools and backup needed to protect the client. It’s almost as if they want her to fail. And as the crowd indeed erupts into a riot, forcing Iris to get personally involved, she learns that things are definitely not all what they seem, causing her to wonder if working for Magni Global is a good idea after all? I don’t want to say too much more, for fear of spoilers, but Blake upgrades both the action and the suspense in this issue, which is generally a good thing. I do have a pretty big complaint though, in the way the event and the client is portrayed. The man, Ben Schoenberg, is said to be a “controversial” speaker and author, yet when we see him speaking he’s literally just saying things like “we shouldn’t demonize everyone who disagrees with us” and we see protesters calling that “hate speech” and accusing him of being a fascist?!? Now, I’ll gladly admit that there are some radicals on all sides of the political spectrum, but this felt like a dishonest and deliberate parody of liberals, making them out to be the extremists who want to shut down anyone who disagrees with them on anything. While I’ve known Blake to generally avoid direct political statements online, I have noticed that she does appear to have a sizable following among the more “conservative” comic-book/sci-fi fanbase (y’know, the kind of people who think calling someone a “Social Justice Warrior” is a good insult), and this came off like a bone being thrown to that crowd. Maybe I’m just being nitpicky, but it took me out of the story, which was a shame as there otherwise are some good plot twists in here, involving Alexander Magni and his motives. Also I really enjoy the interaction between Iris and Mackenzie. I’ve often praised Blake’s knack for writing dialog, and it continues to show in those scenes. Donny Tran continues to do a fine job with the art. He’s given a lot more action to illustrate in this issues, but proves to be capable, if not spectacular. There is some room for improvement, but for a newcomer (I believe this is his first professional credit), he shows much promise. Still a solid issue altogether which, despite my criticisms, I enjoyed enough that I can recommend with a Chacebook rating of 4 STARS.